Please view our house tour video! Click on the back arrow to the left of our main picture and then hit play. Or search "SkyView on LaHave Island" on the web. Also note: To keep our home affordable to Canadians, we've reduced our rates to compensate for the weak Canadian dollar. Our rates are the same as they were two years ago. Experience Nova Scotia island-living at its finest at Skyview on LaHave Island, a 17-year old home perched on the highest point of LaHave Island, above the treetops. Our house is built high like a castle on a hill -- you drive your car up to the second floor door with a bridge to the house. As you enter, you encounter a 2-story atrium with large-window views of the ocean (there are 28 windows and skylights in the atrium alone!) Nearly every window in the house reveals a spectacular vista. Guests have a 360-degree view of the mostly uninhabited, wooded LaHave Islands, and of a picturesque cove, sprawling bay, and vast Atlantic Ocean. We've just replaced all the windows, put up new shingles, and installed three brand new decks with glass-panels. Accessible by car without the need of a ferry, SkyView is located on one of two dozen islands which make up the LaHave islands. We’re a 3-minute walk from the water, a seven-minute drive from the mainland, and a 30-minute drive from Bridgewater, which is the area’s main shopping area. We are 40 minutes from the historic seaport of Lunenburg and seaside town of Mahone Bay, and an hour-and a half southwest of Halifax on the Lighthouse Route. Enjoy the views from 3 decks -- a wraparound deck accessible off the great room, a smaller deck off the study, and a balcony off the master bedroom and study. Relax listening to the seagulls, watching fishing boats in the bay, sunrises in the morning, sunsets at night, a full moon and stars across the sky, and view deer which roam the property. Come home from a day at the beach to warm yourself in front of an airtight soapstone wood-burning stove in the great room. Our home can comfortably sleep 8 adults in 3 bedrooms (all with skylights), and in a den which has a pullout bed. We provide bedding and towels, and a washer/dryer. The house also has baseboard electric heating with thermostats in each room. The kitchen is large and equipped with a stove, microwave, toaster oven, coffee maker, food processor, quality kitchenware and a small breakfast table. The dining room has a large mahogany table with antique chairs. The den has a 36-inch flat screen TV with satellite service, and a stereo with speakers wired to the atrium. The master bedroom has a 36-inch flat screen TV with local channels. Enjoy playing ping-pong on a full-size table in the basement. We also have wireless Internet and the cell service is very good. We do not allow smoking of any kind inside our home. Locally, there are many attractions. Half a dozen beaches are within a 10-minute drive, including Risser's Beach Provincial Park, with a fine-sand beach with lifeguards, winding boardwalk along a back marsh, visitor’s center, a snack bar and shower facility. On our island are many quaint paths and roads to walk or bike, a marine museum, community hall, government wharf, boat launch, a church, and a cemetery. On nearby Crescent Beach, people love to park their cars on the beach, walk their dogs, surf, kite-board, stroll the beach at sunrise and sunset, and of course, swim! Several fishermen and their families still live on the islands, some who will take visitors out fishing or on island tours (ask us). Locals also love to share their community's history through casual encounters along the road and at events like the Monday morning coffee hour, serving the best home-made scones and sticky buns you’ve ever tasted – really. The community hall also hosts guest lectures and other events. Along the Lighthouse Route on the mainland are lots of craft and antique shops, artist studios, restaurants, museums, and historical sites (like Fort Point Museum in LaHave, where the French first landed in Canada in 1604). You can take in musical events, county fairs, farmers’ markets, art shows, ox pulls, movies, theater and more. For sporting activities, you can rent kayaks, golf at several courses, go horseback riding, rock climb, wind surf, para-sail, and enjoy the resort at White Point Beach, where you can get a day pass to use the pools, yard games, and boats. Don't miss the most famous bakery in Nova Scotia, the LaHave Bakery (15 minutes away), where you can sit down in its quaint dining area and enjoy an amazing breakfast or lunch. Another guest favorite is 'The Ovens,' which is a series of ocean caves accessible by wooded walkways, where the waves pound in and out. At Ross Farm, children will love to see a “working” farm where they still raise animals and grow crops. And bake sales and lobster suppers in community halls all over the area are delicious! We've been renting our homes for 20 years to people from places as far away as Germany and Hong Kong. We strive to make our guests' stays completely enjoyable. After you reserve, we will mail you driving instructions, information about the house, and things to do in the area. The house will be thoroughly cleaned before your arrival and if something should occur during your stay, we have a handyman on standby and a variety of service specialists who should be able to fix any problems quickly. We also provide excellent communication by phone and email prior to and during your stay. Our rental rates are priced similarly to other higher-end Nova Scotia oceanfront homes. The cost and the minimum nights we require vary depending on the time of year and the duration of your stay. Click on "show additional rate details" (which is a link just below our calendar on the main page) to see how costs and minimum nights compare at various times of the year. The total rent we charge is in US dollars and includes all taxes. We recently reduced our rates by 20% to help compensate Canadians, who are the majority of our guests, cope with the rising US dollar. Like most Nova Scotia rentals, we rent from Saturday to Saturday. If staying for two weeks or more, the rate is US$100 less for each additional week. Pets are welcome for a non-refundable $100 fee. If SkyView is booked during the week you are travelling, please note that we also own 'THE FENNEL OLD HOUSE,' a renovated 100-year old home next door. It sits on a picturesque cove overlooking a wide bay. The property has gorgeous views from many vantage points, including from 5 decks, a gazebo, and dock. It sleeps up to seven people. Please see HomeAway listing #393316. Mitzi, Dad & Mont Boating in the summer of 1966. On the map below, click on 'Satellite' to see that OUR ISLAND IS CONNECTED VIA 2 BRIDGES TO THE MAINLAND -- a 7-minute drive away. More than 50 years ago, in 1956, our father stumbled upon the LaHave Islands while on a boat tour with a friend. He bought a house from a fishing family and our family has been up every summer since. Over the years we renovated the waterfront home and in 1997, Dad sold that house to the children. We call that the 'Fennel Old House,' and we rent that as well (HomeAway listing #393316). But in 1997, Dad then built a new home, high on the hill next door -- SkyView on LaHave Island. The children have now purchased this house as well and have been renting it for about two years. 1) Beauty -- Unparalleled views of the ocean from above the treetops -- you feel like you're soaring above the earth! Soak in, photograph or paint the vistas from our property, as well as of fishing boats, wharves, and colorful houses that dot the islands. 2) Romance -- Total privacy and relaxation. Enjoy the ambiance of our wood stove, lounging on multiple decks, walks on island paths, and more. 3) Adventure – Dozens of things to do on the popular South Shore mainland area (within 5 to 40 minutes), and quick access to beaches (5 to10 minutes). We provide guests with a guide with directions. 4) Community -- An unusually close group of families, both fishermen and summer residents, who live nearby and welcome visitors. 5) Pets – We gladly accept them. 6) Boating -- Your boat can be moored at the government wharf on Bush Island, a 4 minute drive. Kayak rentals are 10 minutes away. Both bathrooms have shower/tub combo. 360-degreee views of various ocean bodies. Landline service can be provided for a fee. Wood stove in living room is great for extra heat and ambiance! The house, however, does have central heating. 2-story atrium with multiple, large windows and ocean views! Wood stove in living room is great for extra heat and ambiance! Gas stove with oven and 4 burners. Large antique table and chairs. Balcony off master bedrooms and 'The Library' bedroom..
Kayak rentals 10 mins away. At certain weeks of the year, we can provide a slip for mooring and launching your kayaks on our neighboring property. Please inquire. Your boat can be moored at the government wharf on Bush Island, a 4 minute drive. All new decks with glass-panel railings: 1 Wrap-around deck off the kitchen/dining room. Includes 2 Adirondack chairs and 4 upright chairs. 2 Deck off the den. Just one step up to large deck and then another step into the house. Den with convertible bed and bathroom on first floor. Dozens of beaches within driving distance (4 are within 5-10 minutes). On several beaches you can find yourselves one of the only people there! This property was well above our expectations. The term Skyview is appropriate since there was not a bad view in the house. Everything was extremely clean and well-appointed. Everything was clearly labeled for our use. This stay was relaxing, there was an ice storm while there that really set the view apart from the rest of the days we stayed. I would 100% recommend this property to anyone considering a getaway with all the modern luxuries. Our host could not have been more attentive and quick to respond to our questions. It is very clear from the stay the host cares deeply about the property, the presentation, and most importantly the experience of his guests. The location was remote, serene, yet accessible. Very quiet and dark at night with no light pollution. There were a few amenities a short drive away if need be. However, you could also feel like the last person on Earth which is exactly what we were looking for. This was better than I could have imagined. The views from the kitchen and living space are incredible, and you wake up with an incredible sunrise in the master bedroom. You have absolutely everything you need to have a delightful stay, including a list of things to keep you busy in the surrounding area. This is definitely worth a stay, we know we will definitely want to stay again when we have the time. The owner is prompt and thoughtful with his responses, and ensures you are comfortable. Can't wait to go back! Very beautiful property with ocean views and a cozy feel even in the middle of the winter. Would highly recommend staying anytime of year. Breathtaking views at a breathtaking price! Such an amazing location!! Couldn't have asked for a better place for a weekend getaway. The views of the LaHave Islands were INCREDIBLE. It is not too off the beaten track, so getting there with any type of vehicle is completely feasible even in winter. I would recommend winter tires (of course) if it is snowy or icy, as there are one or two little hills before the house. The amenities were fantastic, with windows everywhere! Waking up and looking over the LaHave Islands was an incredible experience that I would recommend to EVERYONE. We also got a heck of a deal for booking in the winter, and the 8 of us were more than comfortable for sleeping arrangements. The wood stove was so nice to sit around, and there was a ton of spaces for us to play board games over the weekend. The area near the house had nice areas to explore, and Mont provided many suggestions for nice beaches and things to do in the area. Being winter we didn't get around too much, but there is an interesting graveyard near the last turnoff to the island which we checked out as well as trails to the water. The second house that Mont rents out is a small walk away and has a nice, close views of the water. Ray P.Where do you live? 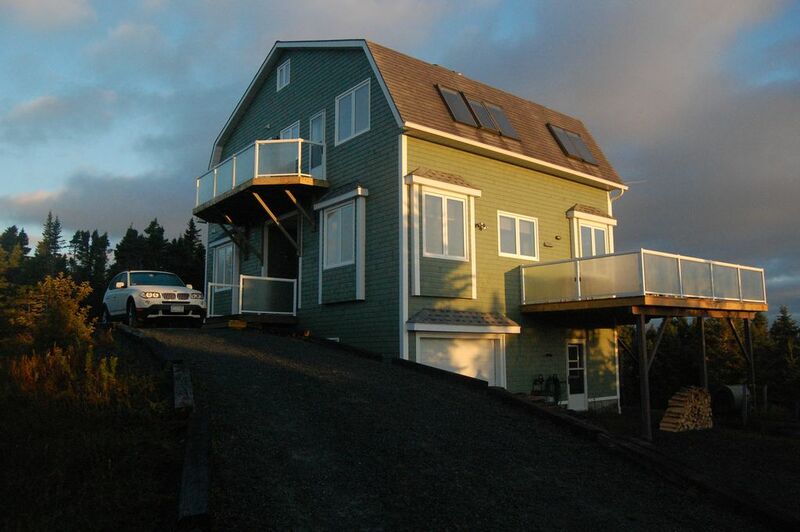 Super value priced location on the beautiful south shore of Nova Scotia! Very bright with tremendous views of the islands and water. Fully equipped with a large assortment of kitchen and dining supplies. Detailed instructions provided on the use of everything in the home. Uniquely private area, perfect for strolling around. A short drive from Crescent Beach, one of the best in Nova Scotia! Certainly recommending to our family and friends. We had a wonderful time at Sky View.. the house and views were fantastic. Loved La Have Bakery, the walk on the Island, and the day at Lunneberg. Beautiful area! Car-Accessible. 7-minute drive from mainland, 40 minutes from Lunenburg, 1.5 hours from Halifax. Dozens of beaches within driving distance (four are within 5-10 minute drive). Other Activities: Boating, Kayaking, Windsurfing, Para-sailing, Wildlife Viewing, Rock Climbing, Spelunking, Golf, Miniature Golf *, Basketball Courts, Shopping, Antiquing, Crafts Fairs, Art/Music/Cultural Festivals, Museums and lots of opportunities to paint and photograph vistas, fish shacks and colorful houses.